As ever, there is much to talk about regarding teaching and learning! 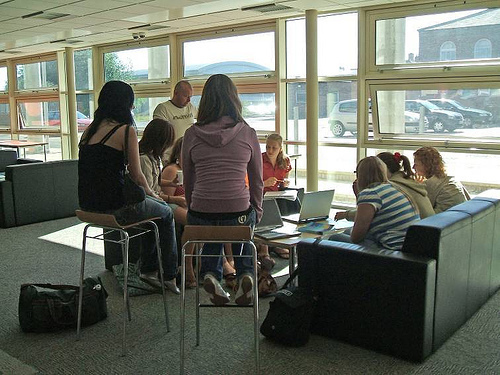 David and John at Edutalk will be working with fellow educators throughout Scotland to provide physical spaces for teachers to meet and chat during 2014. At each event, there will be teachers and other educationists who are involved in the education of young people. Conversations will be organised in cities, towns and villages across Scotland, with the aim of running at least eight events throughout the year. Our standpoint is that those with an interest in teaching and learning enjoy opportunities to talk with familiar faces and new acquaintances away from the ‘chalkface’, and that it is often pleasant to do this away from traditional or regular events, where agendas of one sort or another may exist. refreshments and snacks to share with the group. We consider that respectful, face-to-face group interaction remains powerful and important, and that web technologies should support, not replace this. Those attending Edutalk events are asked to come with ‘something in mind’ with which to stimulate part of the conversation. This could be a: professional issue being ‘wrestled’ with, call for action, brief account of practice, important new knowledge, or something else. Participants are not required to speak at length, and conversation ‘starters’ can be as long or short as desired. Conversation facilitators ensure that equal time is given to each matter, though a group may wish to devote time and energy to certain topics, and indeed go off-topic or even to another part of the building! Conversations are held during weekday evenings, weekends, or school holidays. If you are interested in taking part in an Edutalk discussion, please visit the booking page. If you are interested in facilitating an Edutalk conversation in your local area, please email edutalkr@hotmail.co.uk with your contact details. take responsibility for ensuring that, should they wish, participants are able to communicate an aspect or aspects of the conversation to those outside of it. Edutalk will promote events locally and nationally, and liaise closely with each facilitator, particularly in assisting with sourcing a free venue. Any text or other media produced by a facilitator or group before, during or after a conversation, will be posted at http://edutalk.cc under a Creative Commons license. We hope that by ‘kick-starting’ the idea of local, education-related conversations, they will become self-sustaining and will take many different forms across the country. Think what could be done in your area, and in what ways colleagues and others might benefit. How might you help to make it happen? We look forward to hearing from you!